Due to the emergence of new commitments and the growth of old ones, I am making my final posts to this blog in August/September 2008. This is the second of two brief essays on the philosophical justification for social investing. In my first note on this topic, I compared social investing to the Latvian Gambit, a popular but probably unsound chess opening. In this essay I'll draw another, more hopeful analogy. I guess I should acknowledge that my motivation for elaborating on this theme is partly emotional. On the rare occasions when I've met genuinely influential people, or apparently skilled investors, their interest in social investing has been minimal. Sometimes their reaction verges on pity, or disappointment that I would waste a lot of time on this. I should hasten to add that these people are almost never rude. They're not trying to be oppositional or patronizing. It's just that powerful and accomplished people generally think the world's a pretty tough place, and good intentions don't get you very far. Warren Buffet once told journalist Marc Gunther "I've seen a lot of not-very-good people succeed in business... I wish it were otherwise." Well, let me propose another analogy. I do believe there is another way of looking at this, which casts social investors in a potentially more important - even critical - role. In the early 1920s a group of chess players emerged who became known as The Hypermoderns. They played weird openings - things that had not been seen much before, and which appeared to the chess orthodoxy to be as unsound as the Latvian. They had their victories and defeats. None of them ever became champion (although some champions were deeply influenced by them), but many of the strange openings they played turned out to be pretty good. Some of those openings became standard issue for up-and-coming masters. Ultimately hypermodern openings played a significant role at the top level of play - from Anatoly Karpov's frequent use of the Queen's Indian Defense, to Bobby Fischer's surprise deployment of Alekhine's Defense in his match with Spassky. The point is that the initial reception to an intellectual innovation tells you nothing about its ultimate validity. The greatest chess players in the world thought Alekhine's Defense was a bad idea when it was first played. A generation later, the greatest chess player in the world used it successfully in the most important match of his life. This is the norm. In any field of intellectual endeavor, but especially in competitive ones, new ideas arise, are dismissed, are fought over, and ultimately, if they are valid, become a part of the orthodoxy. This doesn't mean that social investors are right, but it does mean they should investigate and develop their theories. They can certainly expect opposition and indifference, and they will likely meet with these regardless of the validity of their claims. Bill James, the man largely responsible for the modern revolution in baseball analysis, once wrote something to the effect that "if I have to play Galileo...[someone else] has to play Pope." Which was probably true, but also hints at some of the psychological pitfalls faced by the innovator. So, if the opinions of even brilliant theorists and practitioners are not a reliable guide as to the validity of social investing, what might be? I'll offer two answers - one empirical and one analytical. First, from an empirical perspective, we have plenty of performance and market share data now. The social indexes and mutual funds have been closely studied for many years, and their performance has been competitive. And, as the Social Investment Forum's Trends report shows, social investment products have taken share over the years. Any investment style can generate performance and win share over a brief time, but social investing has been operating and growing in influence since the 70s, in every imaginable market environment. To return to our earlier analogy, that seems to fit the experience of the Hypermoderns more than it does the Latvian. But why should we expect our success to continue? What, apart from performance and market share numbers, can we look at when we assess the advisability of social investing? My analytical answer is as follows: When you look at the history of any intellectual endeavor, it is striking how many big discoveries, at any moment up to the very recent past, had not yet been made. We are accustomed to thinking of ourselves as living in "modern times" and we think of our knowledge as pretty complete. But it ain't. Just think of the advances in medical treatments over the past generation. 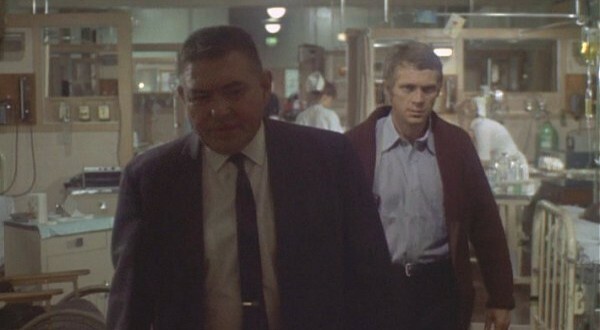 Here is a picture from the 1968 movie Bullitt, which was partly filmed on location in a San Francisco hospital, with real doctors and nurses on the set. The directors were going for an 'authentic' look. Think of what's not there. No computers, no imaging technology, no ultrasound. I think it's fair to say 1968 was a year in modern times - and medicine was very advanced compared to what it had been 40 years earlier. But there was so much more to be learned. I think of social investing in the same way. Whatever the experts say about efficient markets or the power of quantitative modeling, we simply must admit we don't yet understand financial markets very well. I am not just trying to score a debating point here. Our failure to appreciate the magnitude of our ignorance is a real threat to us. There was a terrific article (sorry, it costs three bucks) about the Great Depression in The New York Review of Books last year. Those who think economists march in lockstep should have a look at the debates they have over the Great Depression. There are still many points of contention. Ben Bernanke made the role of financial intermediaries in the Depression a particular specialty in his academic career, which is probably really fortunate given his current role. I occasionally ask the economists I meet if the Great Depression could happen today. No, they generally say, because we have learned so much. John Kenneth Galbraith, when asked about this following the 1987 Crash, pointed out that our safety nets are much better-developed. Milton Friedman and Anna Schwartz pointed out central banking mistakes that almost certainly made a bad situation worse during the Depression- an error Bernanke promised, at a conference honoring Friedman on his 90th birthday, not to repeat. For practical central bankers, among which I now count myself, Friedman and Schwartz's analysis leaves many lessons. What I take from their work is the idea that monetary forces, particularly if unleashed in a destabilizing direction, can be extremely powerful. The best thing that central bankers can do for the world is to avoid such crises by providing the economy with, in Milton Friedman's words, a "stable monetary background"--for example as reflected in low and stable inflation. The theme I take from all this is that, back in those days, we just didn't know. The elites were as confident before the Great Depression as they are today, the speculators were just as arrogant and aggressive. So what don't we know about the equity market? Fama and French might argue that we know quite a lot about past patterns of equity returns (an excellent crash course is here). But as computing power becomes cheaper and backtesting software becomes more sophisticated, isn't it possible that the markets will arbitrage away most of these effects? Mightn't we move gradually from the world Fama and French observe toward one in which there are no exploitable statistical anomalies? Some academics think we've already gone there and beyond - with so many people trying to exploit the same effects, herding can occur, making the market less efficient, not more so. And those happen to be the areas where social investors have been developing their craft these past 20 years. At our best, I think social investors can help markets identify and appropriately recognize good organizations and good management teams. Not everything we do maps to those tasks, and there is plenty of work to be done before we can claim to be adept at it. But that, I think, is the opportunity - social investment techniques may become more important in mainstream investment research. And this is not really heretical. Jason Zweig notes in his updated edition of Graham's The Intelligent Investor that Graham wrote a great deal about governance and management quality in the early editions of the book. As time passed the section got shorter and shorter, because, Zweig speculates, Graham despaired of anyone actually paying attention to it. Graham well understood that the shareholder is in a vulnerable position. When you buy a stock you commit your money to an enterprise managed by strangers. You must ultimately trust those people. But it is difficult for any layperson to assess whether those managers are honest and competent. It can even be difficult for well-connected monitors to determine this, as evidenced by recent developments at U.S. financial institutions. I would not claim social investors have special insight in these areas today. Heck, many social investors owned Enron before it went down in flames. But if you think about where investment practice is going, and where we will have to look to earn returns in the future, I think we are on the right part of the playing field.